Ralph is a 26 year-old regional journalist who’s been having recurring nightmares in German. To help him understand his troubling dreams, his friend Claudia, a 22 year-old hippie, uses her undeveloped psychic powers to give him a profound past-life regression, which floods his mind with memories of being a Nazi commando on a mission in and around the South Downs in 1940. When his visions of that past existence begin to take shape in his current reality, Ralph starts to investigate. In the hope of piecing together his previous life, he goes on a camping trip to the locations he saw in his regression. He is accompanied by Claudia and their respective partners, Andrea and Lucas, who are much more interested in each other than reincarnation. What none of them realise is that the past Ralph is trying to find is now stalking them, and plans to exact a terrible revenge on all four campers for crimes committed nearly seventy years ago. 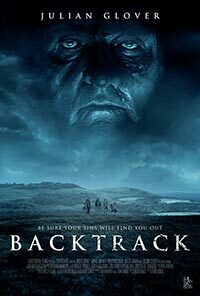 Backtrack is an intelligent and exciting psychological horror film that explores the dark side of reincarnation and karma. What sins did we commit in our past lives and will we pay for them in this one?